East Midlands Trains has been given £46m of taxpayers' money to make the company profitable again. Last year the train operator made a loss of £25m in six months and under the terms of it franchise agreement with the government was eligible for a revenue support grant. The RMT Union said the pay-out was "corporate welfare". The bail-out was revealed by the Department for Transport in a Freedom of Information request by the BBC. 'It's ridiculous' East Midlands Trains, which has been running local and London services in the region for five years, reported lower than expected passenger revenues and received £46,443,000 between last November and June. The government provides subsidies to the rail industry to protect rail companies from the worst of their losses. RMT regional organiser Ken Usher said: "We hear on a daily basis of various cuts due to austerity measures and quite clearly it's a case that this does not apply to big business. It's ridiculous." The company said it and its sister operator South West Trains made a net contribution to UK taxpayers of more than £280m during last financial year. 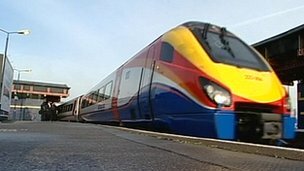 An East Midlands Trains spokesperson said: "Rail franchises were let by the Department for Transport on the basis that the government accepted it would get high premium payments when the environment for rail was strong, but it agreed to provide contractual revenue support when tough conditions meant revenue growth was lower than expected. "We have had several tough years during the economic downturn and East Midlands Trains was loss-making in 2010/11 and during the first six months of the last financial year. "Despite this, we have continued to meet all of our franchise commitments to government and we continue to invest millions of pounds to improve our trains and stations to encourage more people to travel on our network." Lilian Greenwood, Labour MP for Nottingham South and a shadow transport minister, said: "Train operating companies across the country need to justify their receipt of taxpayers money at a time when too many services are overcrowded and the government is allowing fares to rise by up to 11%. "The onus is now on the company to make sure that the money is spent on improving services for passengers, instead of bolstering shareholders' profits." In its response to the BBC's Freedom of Information Act request, the Department for Transport said: "Under the terms of its franchise agreement with the Department for Transport, East Midlands Trains became eligible for revenue support on 11 November 2011. "The amount of revenue support paid to East Midlands Trains up to 18 June 2012 is £46,443,000." It said the figure was calculated and paid to East Midlands Trains based on information received about its revenue.